As a former producer of foie gras I’m probably the only reader of this blog who can provide first-hand evidence. After the first few days of force-feeding my geese caught on to the procedure and would come to me to be fed. Inserting a tube into their gullet is painless – the person doing the job would be the first to know if there was discomfort. A goose which has been feeding on grass all day comes home with a great bulge in its neck, which is a flexible storage area. I’ve not been in a commercial foie gras factory in eastern europe or elsewhere, so I don’t know about conditions there. There are good and bad examples in all animal-producing branches. But in southwest France the local producers that I’ve met wouldn’t dream of keeping geese in tiny stalls during the period of gavage. You only get good foie gras from healthy (and happy) birds, and geese are highly social. Take a look at the first picture of Egyptian foie gras production above. That’s how it’s done, with the feeder sitting down and the geese milling around. Notice the goose nibbling away at the food on the stool while awaiting its turn to be force-fed. That was precisely my impression, but I, of course, cannot speak with the same authority as a person who actually reared the birds for foie gras. Here’s an interesting and detailed article The Physiology of Foie: Why Foie Gras is Not Unethical which describes how foie gras is produced on an American farm. Also watch this movie for the actual process of gavage (in France). Here’s a video about the whole process of producing foie gras at la Ferme de Souleilles (it’s in French, but I think it’s pretty self-explanatory). The main point is that there is nothing particularly bad about gavage (which, by the way means “stuffing”). 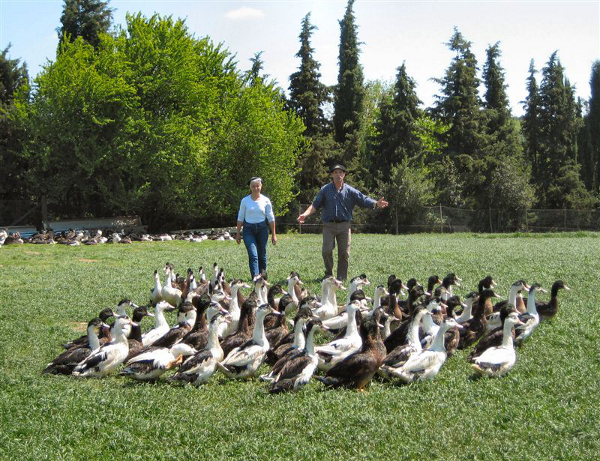 That’s what ducks and geese do when they need to store enough energy for the migration. The opponents of foie gras use the bait-and-switch tactic – ostensibly they are against the gavage, but instead they show horrible videos of birds held under inhumane conditions in cages, which is a completely separate story. Such intellectual dishonesty doesn’t strengthen their case, to say the least. I find it remarkable that the same people, who protest against force-feeding ducks through their gullets, have no objection to force-feeding Guantanamo detainees through their anuses. I suspect that my Russian colleague is incorrect, and these are quite different groups of Americans (people outside the U.S. tend to think of the Americans as one monolithic mass). On the other hand, the state of California, which has banned both the production and sale of foie gras, has no problem with employing John Yoo as professor of law (!) at the University of California. platyrhynchos, has come to be used extensively (94% of foie gras production in 1995). wild muscovy ducks are non-migratory. Dear god! Isn’t it obvious, the happiest birds of all are those not killed for human consumption, christ I get so sick of human beings trying to justify their perverse actions. I see that it’s a painful reading for vegans who consider meat eating a perverse action. On the other hand, the happiest plants must be those which are allowed to flower and go to seed etc and not have their leaves, stems,roots and fruits eaten. It’s not eating meat, per se, but the production of the meat and the way that animals are treated prior to being killed (and often the way they are killed to for that matter) that disturbs me. PLEASE don’t get on my case for caring! After 33 years of not eating meat I am tired of meat eaters attacking me and getting defensive because i stand by my convictions.. And BTW I have serious problems with just weeding the garden, I am a sensitive and empathic soul, what can I do. I am sorry. I didn’t mean to hurt you. My only point was that this is a fact of life that in order to live at all we need to kill other living things and there is no way around it. If the geese are free range, have plenty of food, no predators, this is as happy a life as they can get (while it lasts). The Russian bloke’s observation is a glib unfounded remark. Most people I know who want good animal welfare also want good human rights too, pretty much everyone I’ve known over the years who was an animal rights activist was a human rights activist too, they just focussed more on animals because there are plenty of other humans concentrating on the human side. You didn’t hurt me, you pissed me off because I am tired and bored with the same view over and over again towards other species. I agree free range is best, of course, but it’s the exception rather than the rule. And yes, there is a food chain, but does it have to be so bloody cruel and do we have to eat so much meat – I think the answer to both is no and we should work towards that.